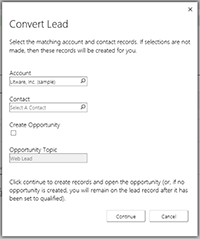 Dynamics 365 currently forces users to create an opportunity every time they qualify a lead. Eliminate the clutter with this easy-to-install solution that correctly maps data and keeps lead and contact records more organized. Licensing available for CRM 2015+ on-premise or online, and Dynamics 365. Ready to be the CRM hero for your sales team? Fill out the form on this page and we'll get in touch!